The galaxy cluster Abell 2029 is composed of thousands of galaxies (optical image, right) enveloped in a gigantic cloud of hot gas (X-ray image, left), and an amount of dark matter equivalent to more than a hundred trillion Suns. At the center of this cluster is an enormous, elliptically shaped galaxy that is thought to have been formed from the mergers of many smaller galaxies. 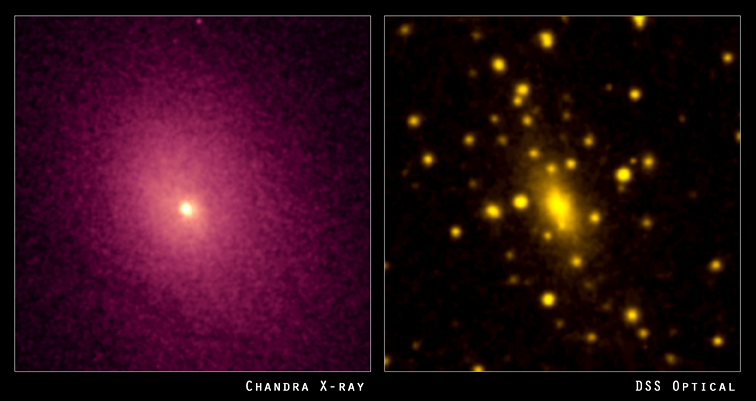 The Chandra image shows a smooth increase in the intensity of X-rays all the way into the central galaxy of the cluster. These X-rays are produced by the multimillion degree gas, which is confined to the cluster primarily by the gravity of the dark matter. By precisely measuring the temperature and intensity distribution of the X-rays, astronomers were able to make the best map yet of the distribution of dark matter in the inner region of the galaxy cluster. 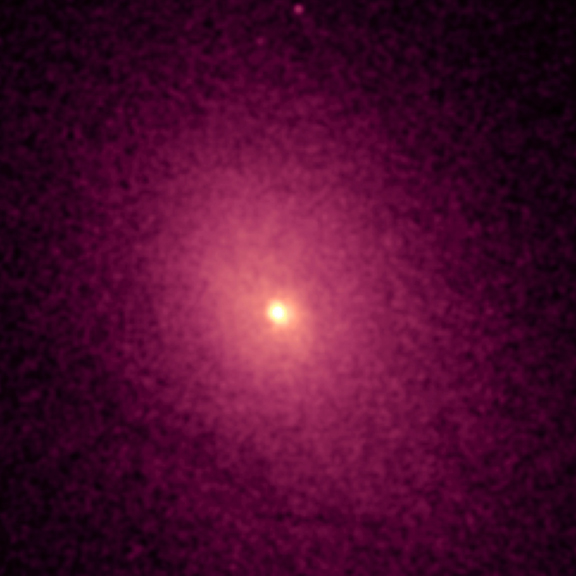 The X-ray data imply that the density of dark matter increases smoothly all the way into the central galaxy of the cluster. This discovery agrees with the predictions of cold dark matter models, and is contrary to other dark matter models that predict a leveling off of the amount of dark matter in the center of the cluster. If Abell 2029 is a representative sample of the universe, these results indicate that 70 to 90 percent of the mass of the universe consists of cold dark matter - mysterious particles left over from the dense early universe that interact with each other and "normal" matter only through gravity. Cold dark matter gets its name from the assumption that cold dark matter particles were moving slowly when galaxies and galaxy clusters began to form. The exact nature of these particles is still unknown. Scale Image is 4 arcmin on a side.